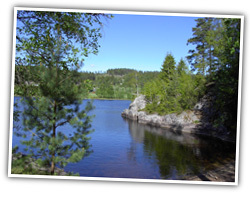 Bullarebygdens Camping is situated beautiful by the north part of Bullarelake in Vassbotten, almost by the Norwegian border. We can offer a quiet and peaceful environment with nice cottages, popular route for canoes both in Sweden and Norway, good opportunities for fishing and bathing. Camping side has: Places for caravans/ mobile homes/tends most of them with electricity. There is TV room, reception with a small store ( bigger grocer`s shop /ICA/ lies 10 km from camping place), service house with toilets, showers, baby room, handicap bathroom, kitchen and a room for latrine emptied. Low season: flexible . You can reach us always by telephone or by mail.